This blog post was submitted by Vice President of International Joe Wojcik. This blog entry was submitted by Reliv’s Vice President of International Joe Wojcik. I ran the Boston Marathon a week ago and wanted to share a few thoughts and comments on the world’s oldest marathon race — now in its 115th year. A race that started out with 15 runners in 1897 now hosts 27,000 marathon participants. The race is always held on Patriots’ Day, and this year was a perfect day (for runners of course) with temperatures in the high 50s, mostly sunny and even a bit of a tailwind, which is unusual on this route. I have done this race for each of the past three years, and it is always kind of an annual father/son weekend for me and my Dad. Unfortunately, he hurt his ankle this year and missed the race, although he was in Boston to cheer me on. He was disappointed but did still manage to get in a two-mile run that day to keep his 34-year running streak alive. I am amazed at how he can run every single day of every single year for that many years. My uncle from Texas also ran this year, and we had fun at the Athlete’s Village where he gave me some pre-race tips (he has run Boston 11 times so it is old hat for him) and told me a few jokes to keep me loose. I downed a shot of 24K™ and wished him luck and made my way to the starting line. You see a lot of people dressed up in Revolutionary War garb along the route in honor of the holiday. You also see people holding up the scores of the Boston Red Sox game in case you were wondering how the Sox were doing while panting your way back into Boston. There are an estimated 1 million people lined up to watch the race, which makes it quite special (and pretty loud). One of my favorite sections is running through the gauntlet of screaming women from Wellesley College at the 13-mile mark. You hear them before you see them and they have signs that say stuff like “Kiss Me – I’m a Senior” and “Kiss Me – I’m from New York.” The conventional wisdom is that if you are having a good race, stay to the left to keep focused (they are on the right), and if you are having a bad race, you might as well slow down and enjoy the adulation. It is the closest you can get to feeling like a rock star for most of us middle-aged marathon runners. I was having a decent day so I just took it all in stride and watched some of the other guys chit chat with the girls for a few seconds or give them high fives. 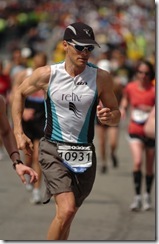 I wore my Reliv singlet and a black Reliv logoed hat that I got from our great marketing department. It was terrific to hear all the support from the fans along the way, especially when they yelled out “Go, Reliv!”, “Reliv Rocks!” or “You can do it Reliv!” One woman yelled out (in her thick Boston accent): “Honey, look — it’s a Relivah!” I am sure proud to be one of those (even if I had never heard that particular term before). My real favorite section of the race is the last 1,000 meters on Bolyston Street by the Prudential Center where the crowd is just roaring and they yell out your name as you cross the finish line. It gives me the chills every time and I feel a tremendous sense of accomplishment. This year was my best performance at Boston. I finished in 3:23:58, which placed me 5,942 overall. I beat my time from last year by 5 minutes so I was especially happy. 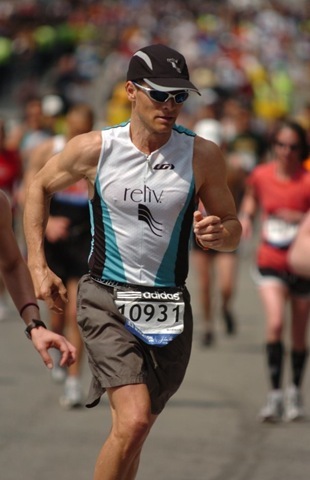 Thanks to everyone at Reliv for their support and encouragement as I keep seeking to turn back the clock.